A cost effective solution for the reduction of sand, silt, rust, dirt and scale particles. 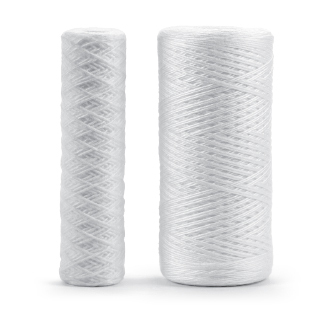 Made from 100% Polypropylene cord, SWC Series String Wound Cartridges can withstand temperatures of up to 165 °F (73.9 °C). are suitable for a variety of applications including residential and commercial applications using both municipal and well water. 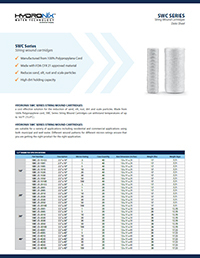 Different wound patterns for different micron ratings ensure that you are getting the right product for the right application. *WARNING: Do not use with water that is microbiologically unsafe or of unknown quality without adequate disinfection before or after the system. *Special lengths and diameter available.